LAS VEGAS – Andres “Sasquatch” Gonzalez conquered his beast and upset the Champ. 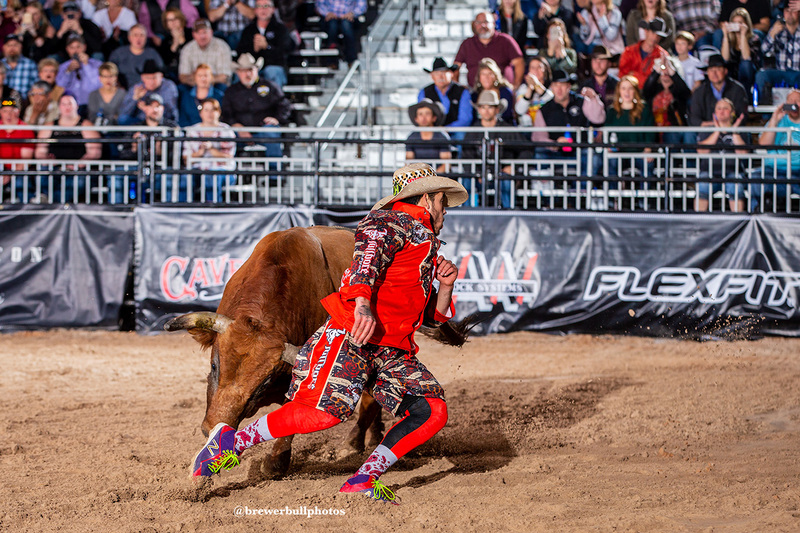 He posted the highest-marked bout of this year’s Bullfighters Only Las Vegas Championship during Wednesday’s Flexfit Preliminary Round, scoring 87 points to advance to Hooey’s Championship Saturday at the Tropicana Las Vegas. “This was super big knowing that I was able to compete against Weston Rutkowski and knowing I was a point behind him going into today,” said Gonzalez, a first-year BFO bullfighter from Woodland, Calif. “Knowing what I had to do had me in the right mindset. Combined with his 83-point fight in Monday’s first round, Gonzalez finished with a two-bout cumulative score of 170 points to outlast the reigning two-time world champion. By winning his flight, which was made up of three bullfighters, he advanced to the final day of competition, along with the other flight winners, Tucker Lane McWilliams of Oak Grove, Mo., and Ross Hill of Muscle Shoals, Ala.
That was the main difference, but both men put on tremendous fights against bulls that had never seen the bright lights of Las Vegas. “All three bulls in our flight were fresh, so I didn’t know what they could do,” he said. “I just had to do what I could, and that was be as aggressive as I can. My plan is to fight my first bull Saturday and advance to the second fight, too.